Vail and Beaver Creek have both received about a half a foot of new snow this week, with a couple of more inches in the forecast through midday on Friday. Colder temperatures have allowed crews to test new, high-efficiency snowmaking systems at both resorts. Consistent snowfall and colder temperatures this fall have put Vail and Beaver Creek on track to open with above-average conditions on Friday, Nov. 22, and Wednesday, Nov. 27, respectively. Loveland and Arapahoe Basin – the two Colorado resorts already open for the season – respectively reported 4 inches and 2 inches new overnight Wednesday (Oct. 30). Next up, Keystone and Copper Mountain open on Friday, Nov. 1. Beaver Creek’s new, high-efficiency snowmaking system (Vail Resorts photo). Keystone will be offering 65 acres of skiable terrain and top-to-bottom snow riding on Dercum Mountain. Wolf Creek in southern Colorado opens up again this weekend on Saturday and Sunday, Nov. 2-3, and then opens for the full season Nov. 8, along with Breckenridge. After a week a sunny, warmer weekend, Opensnow.com is calling for another even larger storm to move into the state Sunday night and dump double digit inches of snow across the heart of ski country through Tuesday of next week. 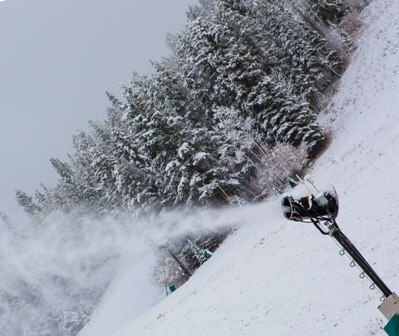 At Vail and Beaver Creek, new, high-efficiency snowmaking compressors this season should result in an energy savings of approximately 3.3 million kilowatt hours compared to previous compressors — or the equivalent of the amount of energy used by more than 300 U.S. homes. The new compressors will push air through underground snowmaking pipes to snowmaking locations across the mountains, where the air will then be used to propel water through the snow guns and into the air to make snow. A single new compressor at Vail will replace eight old compressors, and Beaver Creek’s new compressor will replace seven. In addition to making the system more efficient, the new compressors provide the highest quality snow surfaces for skiers and snowboarders. Vail, Beaver Creek and local utility Holy Cross Energy – a member-owned electric co-op — teamed up on the initiative, which contributed to the creation of a new rebate program for similar large, custom commercial energy reduction projects. This joint project will help Holy Cross Energy achieve 10 percent of its five-year energy efficiency goal. “The compressor replacements at Vail and Beaver Creek are a great example of how we can work together with our community partners as well as a significant step in Vail Resorts’ new companywide energy reduction goal, ‘The Next 10,’ which aims to cut our company’s energy usage by an additional 10 percent by 2020,” said Chris Jarnot, senior vice president and chief operating officer for Vail Mountain. In late 2008, Vail Resorts set out to reduce its energy use by 10 percent, and in early 2012, the company surpassed its target goal. Through a continuous focus on energy conservation, Vail Resorts was able to reduce its electricity and natural gas usage by 10.75 percent through more efficient operations. The Next 10 Percent energy reduction goal for 2020 includes efforts such as reassessing operational efficiencies, examining ways to improve snowmaking, increasing building automation, investing in free cooling and LED lighting upgrades, and implementing additional energy efficient technologies. Beaver Creek’s new compressor is up and running for the resort’s snowmaking operations as weather permits, including snowmaking on Beaver Creek’s new signature ladies race course, Raptor. The course will field competition Nov. 29 through Dec. 1 and serve as the ladies speed course for the 2015 World Alpine Ski Championships. Vail’s new compressor will be ready to turn on as early as Nov. 1 for snowmaking operations across the front side of the mountain in preparation for the public on opening day, Friday, Nov. 22.